For fans of: Douglas Adams, Christopher Moore, Tom Robins, Third Rock from the Sun, Groundhog Day, Hot Tub Time Machine, and Harold & Kumar go to White Castle. For fans of Terry Pratchett, Douglas Adams, Christopher Moore, Tom Robins, Third Rock from the Sun, Groundhog Day, Third Rock from the Sun, Community, Hot Tub Time Machine, Harold & Kumar go to White Castle, and Bill & Ted's Excellent Adventure. About the Author: Russ Colchamiro is the author of the rollicking space adventure, Crossline, the hilarious sci-fi backpacking comedy series, Finders Keepers, Genius de Milo, and Astropalooza, and is editor of the new anthology, Love, Murder & Mayhem, all with Crazy 8 Press. Review: This was a funny new installment in the Finders Keepers trilogy. 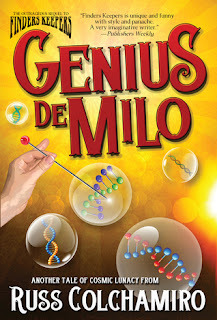 A race against time, and a new crazy villain, Genius de Milo is a must-read for comedy and sci-fi lovers alike. Theo and Jason can't seem to stay out of trouble, and must again save the Earth from disappearing. Not your typical heroes, they nonetheless find a way to do what they must to ensure their survival.